James Wall, 67, of Longmont passed away March 28, 2018. He was born on May 19, 1950, in Denver, Colo., to James Thomas and Maxine (Halberg) Wall. Jim graduated from Lakewood High School in 1968, and he studied at the U.S. Naval Academy from 1968 to 1972. He received his master's degree from the University of Mississippi. Jim served in the U.S. Navy, and he married Jeri Toteve on June 18, 1972, in Lakewood, Colo. They moved to Longmont in 1993. Jim was the IT director for the city of Longmont, and a member of LifeBridge Christian Church. Jim was a member of the Hygiene Volunteer Fire Department. He was involved in several church organizations he enjoyed driving the firetruck for special needs children when they came to visit the ranch. He also enjoyed horses, camping and fishing as well as lacrosse, football and pickle ball and time with family and friends. Jim is survived by his wife, Jeri; a sister, Linda Joyce (Michael) Therrien; his mother-in-law, Peggy Toteve; brothers-in-law, Terry (Linda) Toteve and John Toteve; nieces, Michelle and Erin Toteve; and nephews, Aaron and Chris Henry. A funeral service was held April 5, 2018, at LifeBridge Christian Church, Military Honors were rendered at the Church after the service by the U.S. Navy and American Legion Post 32 of Longmont. Interment followed at Longmont Mountain View Cemetery. 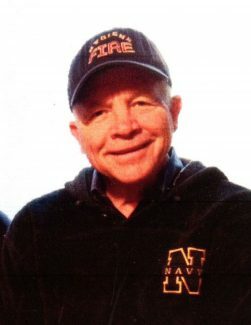 In lieu of flowers, memorial contributions can be made to the Wind River Ranch, Hygiene Fire Department or the Salvation Army. Share condolences at http://www.ahlbergfuneralchapel.com.